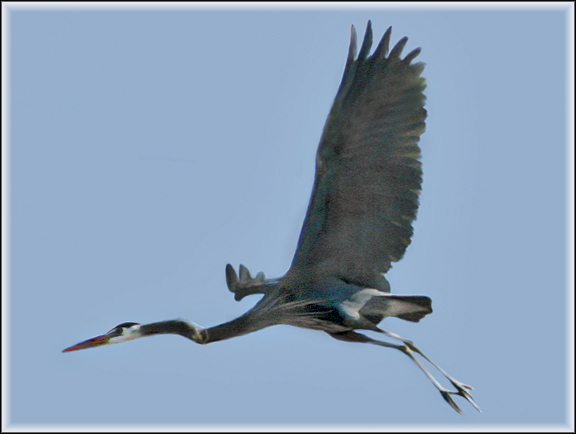 For those of you wishing to take a Group or your family to see the Nesting Great Blue Herons at Holland Ponds Park, we put together a 3 page download to help you better understand this unique place, along with a detailed Map to help get you around the Park. 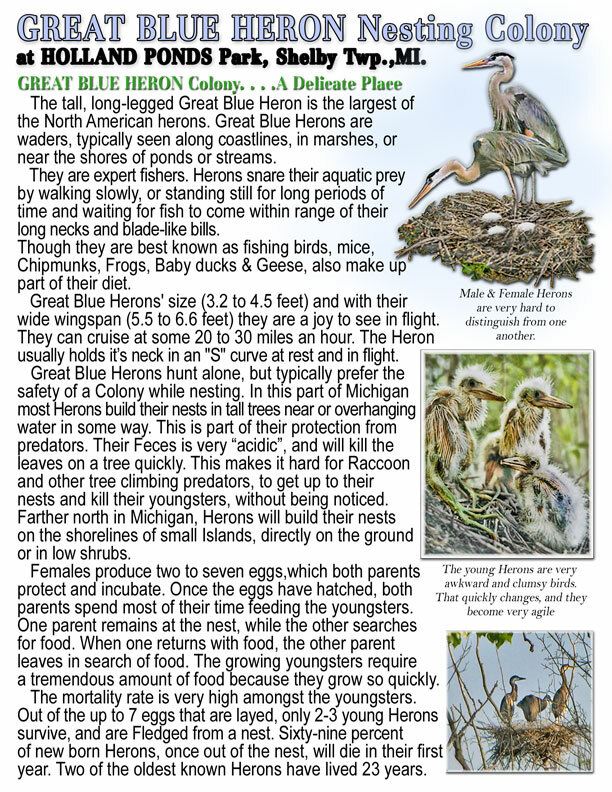 We hope these informational sheets help you enjoy these magnificent Birds and all that they face to produce youngsters each year in this Heron Colony at Holland Ponds. It seems that over the last week or so, during or right after all the rains, the front heronry at Holland Ponds received some severe damage. Two of the largest nesting trees fell to the ground, as well as a couple of branches from still standing nesting trees, also cracked off and fell. This destroyed at least 8 active nests to our accounting. This is a major catastrophe to the Heronry, especially since all of these lost nests where active ones, with either hatchlings or eggs in each of them. In youngsters alone there is a loss of some 40-50 new young Herons. Apparently in the cases of the two full Trees that came down, they where undermined by water and the shallow root system gave way, toppling these two nesting trees. There were also some decayed branches that let loose, cracking free from the main nesting tree and bringing additional nests with them, to the ground. On closer examinations, it appears that a number of other branches and nests are in jeopardy of not withstanding to much more punishment from Mother Nature and any further high winds or pelting rains. This is just a small example of the destruction in the front Heronry section of this Heron Colony. 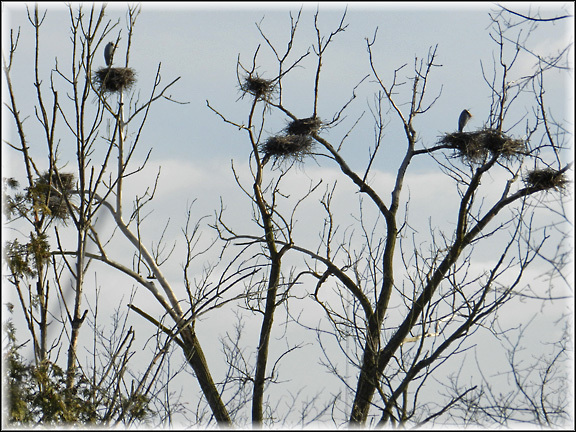 It is a perfect example of how delicate the balance between Nature, Weather and outside influences can be on such a unique and special place as a Great Blue Heronery nesting site. A positive note here, is that a couple of years back, the Herons decided to start to build more nests a little further southwest of what was the original front area nesting sites. These nests are on higher ground with Trees more deeply rooted in the soil and not being undermined by some much standing water as with much of the front nesting sites. But this is not the only answer or fix to this delicate balance here at the Holland Ponds Colony. Look how quickly some many nests and future Heron youngsters where instantly wiped out. There are even mated herons that appear to be wandering the Colony in disbelief, with no available nests and no where to go at the moment. These are not resilient Birds. They had already bonded with a mate, mated, set up a nest, had eggs, and some some cases those eggs had already started to hatch. Then…..out of no where, they have NOTHING. Like many humans, they are lost, with no place to go, The common sense understanding that these mating pairs of Herons would just re-mate, rebuild a new nest and start all over, is not something we can expect to take place with Great Blue Herons. Through studies, this does not seem to be their way. That is why if chased off of an existing nest or bothered by man enough, these Birds will also just abandon their young and nests and leave. The pressures being placed on these beautiful creatures by the weather, Mother Nature and Shelby Parks & Recreation is starting to become to much for this well established Colony. Soon…..they will be forced to endour a new Bike Pathway down the center of the Park, with the constant moving Bike traffic, up and down this new Pathway. 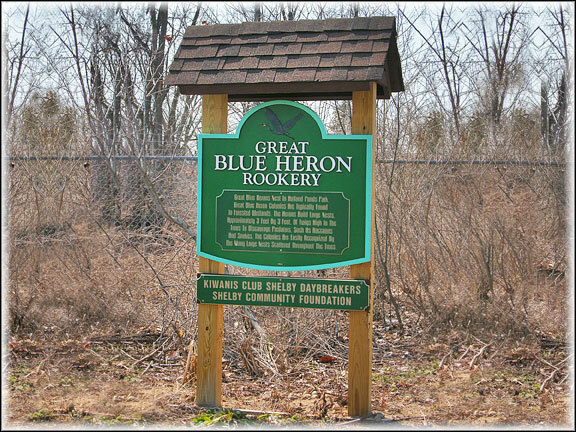 This is what destroyed the 200 nest Heronry in West Bloomfield, many years ago. Just how much can this unique setting withstand? The massive cuttings around the many ponds at the Park have destroyed or eliminated many of the Turtles and most of the frogs in these ponds. The raw stripping of ground cover close along the banks of these feeding ponds have eliminated major food sources for the nesting Herons as well. Just how much pressure can this Colony withstand? Does Shelby Twp. Parks & Recreation even care about this very unique environment they are lucky enough to have for their residents and guests in their own Community? The largest Great Blue Heron nesting site in Southeastern Michigan is not special enough to want to take care of such a place? Instead……they add to the pressure that Nature and the weather already put on these beautiful birds and their 10 year nesting Colony. I am ashamed that people would knowingly do such things. I am ashamed that after even being told by others who know so much more then they do about these great Birds, they ignore the advice and facts and just continue to do the worst possible things they could do to help in the pre-destruction of this Great Blue Heronry. Their blind focused vision of a silly Bike Pathway to nowhere, except right through a Nature wonder, and considering this Bike Pathway to nowhere, more important then this unique Great Blue Heron nesting site, borders on criminal. Ask Shelby Twp. Parks & Recreation why their Bike Pathway plans are more important then these 10 year nesting Herons, producing over 100 youngsters each year to be help maintain the Heron populations in Michigan. They can build as many new Bikes as the factory can pump out. How about new baby herons. What’s the plans there? There is a scheduled HERON FESTIVAL coming up soon, sponsored by Parks & Recreation. REALLY??????? celebrating what? The death of these magnificent Birds. They are not only fighting the normal battles of weather and what nature throws at them, but here at Holland Ponds these herons have to withstand the destructive and manipulative forces of a Parks & Recreation that refuses to understand, seek knowledge or bother to do anything but move forward on the Bike Pathway to Nowhere, while they blindly destroy the habitat and natural environments around the feeding Ponds at the Heronry. Bikers are Nature lovers too, and I know of no Bike riders who would want this kind of sacrifices of such a unique and special place as these heron nesting sites, for just another Bike Pathway to Nowhere. And what about our own state DNR donating $300,000 of OUR money, to Shelby Twp. to match, to get all of this destruction completed. Can you believe that one? The Department of Natural Resources, spending money to destroy the largest Great Blue heronry in Southeastern Michigan without any research or investigation into the matter what so ever. Just the lone word of a Shelby Twp. Parks official who states……No Problem. We have three Maps available for Shelby Twp. Parks. One is our Map of Holland Ponds. This Map is now three years into edits and detailing. Very accurate and GPSed Map of the Park and heronries there. We also have an adjoining Map that will guide you from Holland Ponds Park, over to Yates Cider Mill. This is a great Hike in Fall to see the Colors along the river Trail, stop in for Cider and then return to Holland Ponds Park. All without fighting the hideous traffic that congests Yates Cider Mill when the apples are flowing there. 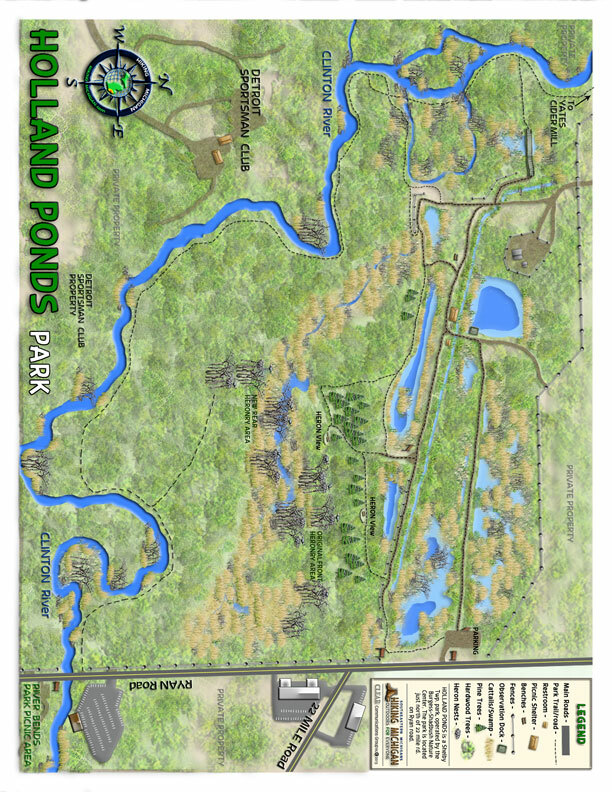 We have a Map of River Bends Park, primarily showing the Nature Center side of the river and Park. This again is a detailed Map that has been GPSed over the last couple of years. A great Map to follow the various Hiking Trails that are behind the Shadbush Nature Center and those that follow the river up to the bridge. We are about to finally release our full Map of River Bends Park, showing the entire Park. Both sides of the river have been GPSed and detailed out. All the various Trails are indicated including much of the unique foliage that still exists there. Also indicated on the new Map are the remnants of the old Clinton/Kalamazoo Canal and the Mule trail that paralleled the Canal. We have been studying a brand new, two year old Heron Colony, and another very large and old heron nesting site in Southeastern Michigan. It is allowing us the opportunity to compare notes from the 10 years of study at Holland Ponds, to another older nesting site and a new two year old site. There are very few studies of any sort on Heron nesting sites. Almost none in Michigan. Just some of the basics, and they are almost 15 years old and actually list No Heron nesting sites in Macomb county. 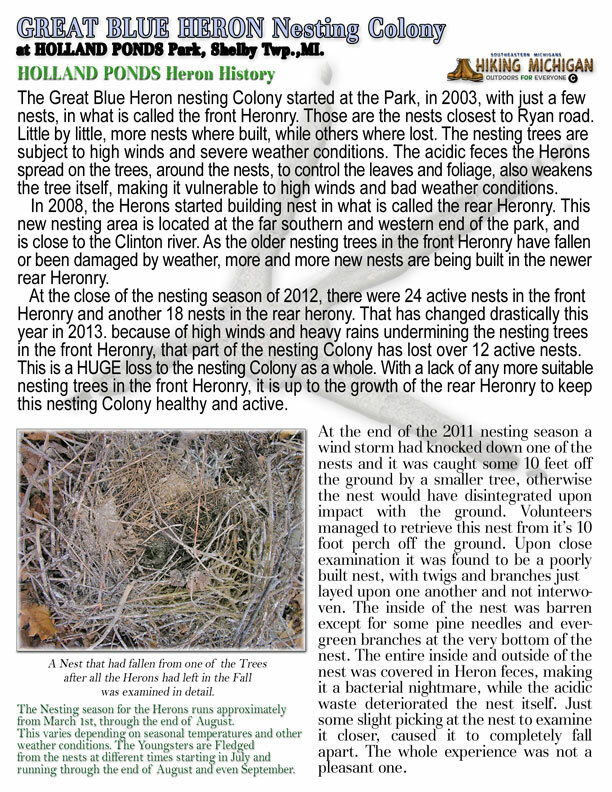 They do not even acknowledge the destroyed Heronry in west Bloomfield which contained over 200 nests. This Colony was destroyed in less then two years after the construction of a Bike Pathway there. Even Audubon has confirmed this fact now, and is working with DTE in constructing nesting Poles to attract the Herons back. They have been unsuccessful at their attempts so far. 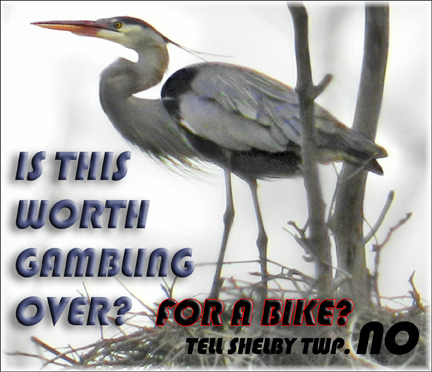 Most likely, as long as the disruptive Bike Pathway remains, the herons will not return. We have found some up to date research out of Wisconsin. But we have learned that herons differ from area to area in their behaviour around their Colonies. depending on whether the Herons are ground nesting, nesting on an Island or in Trees. All this will affect their behaviour at the nesting Colony. Even when Herons nest in Tress, it will vary depending on whether those tress are over water, isolated from people directly or exposed to constant movement of any sort. This is the main concern about the fast moving Bikes projected to pass down the new BIKE Pathway to be constructed at Holland Ponds this summer. If there will not be a constant flow of Bikes on this new almost million dollar Pathway, then what is the point of it at all? The facts appear to conflict with each other. Either the Bike Pathway will be a success and draw in all this money as claimed by the proponents of the Pathway, or it will not. Which is it? Depending on what Newspaper article you read, will depend on what various officials have to say about the Pathway, the Heronry, the Money, the reasons why IT MUST HAPPEN. There is no consistent reports on this new Pathway through Holland Ponds. Lots of good wishes, but no real facts. There is still much to be examined before this Pathway is installed if Parks & Recreation and our own Department of Natural Resources can justify such a Gamble at constructing a new BIKE pathway at Holland Ponds, that is very similar to the one that destroyed 200 nests in West Bloomfield. We have requested the research and data the DNR should have collected before they gave Shelby twp. some $300,000 to construct such a Pathway with our money from our Parks PASSPORT system. Before the protectors of our state’s Natural Resources (the DNR) donates that kind of money and then the local Parks & Recreation in Shelby Twp. matches it, You would believe all these entities would have extensive studies and data to confirm their actions are sound and not Nature destructive. We shall see. Empty Bike car roof racks, do not add up to a successful mis-named HIKE-BIKE Pathway as recently quoted in in a local Shelby Twp. Newspaper. No research or data from anyone, and just well wishes and the whole project is nothing more then one big Gamble, based on those well wishes, dreams, and absolutely NO sound data, research or determinations made from facts. Not sound judgement what so ever. Just a Do or Die for the Herons. This has been a very different year for the Great Blue Heron Colony at Holland Ponds park. herons started arriving there in the 1st week of March, and have been trickling in ever since. Most years, towards the end of March there is a big surge of returning Herons that quickly fill up all the available nests at the heronry. then the stragglers will fill up the remaining nests and build new ones if needed. The process has been very different this year. No real big surge of returning Herons. A small group real early in March and then little by little the rest of the existing nests have been filled by returning Herons. The Great Blue Heron spends it’s winter months south of Michigan. Anywhere from the Carolinas to Florida and South America. Like Salmon, many of the returning Herons have either been here before nesting, or are the youngsters from a previous fledged nest. This is just one reason why it is so important to protect and existing nesting site like this. It is a place the Herons remember and also where the hatched youngsters from a previous nesting season, will come back to each year, looking to nest in the safety of others in an existing Colony like Holland Ponds. The herons act very different during this mating and nesting times. They are very skiddish and nervous birds during these months of raising their young. herons are always a bit of a nervous Bird. But this is exaggerated tremendously during nesting time. It is interesting that they will tolerate what they know will not hurt them. In this case…..Ryan road traffic is something they have become accustomed to and ignore. So is the Gun shots heard from the Detroit Gun Range nearby. But bring in something new, or produce alot of movement and noise and they will abandon the nests. Even if there are young in the nests. I have watched the entire Colony leave the nests because a group of Fisherman walked along the river’s edge behind the heronry, talking loudly. these Fisherman did not know the nests are ever there and could not see them during the summer when the trees in the rear nesting site are covered with leaves. Signage is needed on the south and east sides of the heronry to warn Fisherman of their approach to a delicate area of nesting Herons. We have mentioned this to Parks & Recreation in Shelby Twp. and hope that very soon something will be done to prevent further disturbances of this unique nesting site. It takes care and nurturing for a place like this to exist and flourish. We would be happy to advice the Parks & recreation people of some of the things they could do to assist the growth of this very special place. Many people love to visit the park and watch the Herons grow and feed their youngsters through out the summer months. It would be a huge shame to have this 10 year growing Heron Colony, fail for simple reasons that could have been easily and inexpensively corrected. These are some recent pictures from Linda Urban, local nature photographer. 3/30/13 and all is well at the Holland Ponds heronry. 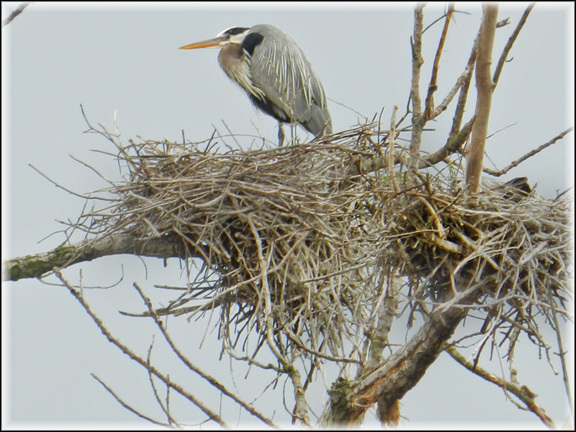 Most of the existing nests have mating pairs of herons on them. And many of the females are already sitting on the nests, indicating they are about to lay eggs or already have. No new nests being built this year though. Puzzling. Maybe there will still be another migration of Herons to arrive yet, at the Heronry. Hopefully so. I will have an actual nest count next week. 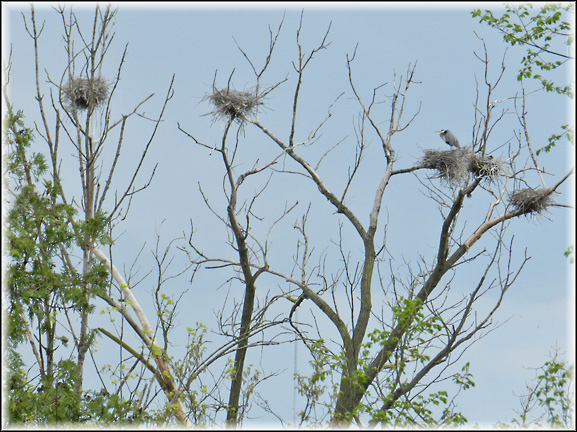 We lost over 10 nests this last winter, due to two separate wind storms that took down two different nesting trees in the front Heronry. Great thing the Herons decided a few years back, to expand the heronry to the forest near the river and created the new rear nesting site. That site is a bit more secluded and plenty of room for expansion. Get out to Holland Ponds, relax and enjoy the mating herons. It is such a wonderful way to enjoy such a beautiful Natural area for now. Enjoy it while we still have it.